I don't know who or what you are and I don't know what you sell or to whom you normally sell it. 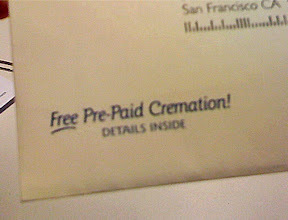 I do know, however, that "Free Pre-Paid Cremation" is probably not the best way to reach your currently living breathing customers. Oh no. That what happens to the aged such as yourself. Have you already started receiving your social security mail too. Oh joy. Exactly what I've been looking for. LOL @Dixie.